The relaxed structure of a cardigan makes it a great option for casual outfits. Best of all, you can easily find one to suit your personal style that will blend seamlessly into your weekend wardrobe. If you're after a versatile piece, try a simple black style. Then, whenever you're in need of a quick casual outfit, just pair it with a T-shirt, jeans or chinos, and sneakers. The versatile cardigan can also easily be transitioned into your work wardrobe for a great business casual look. Try using it as a replacement for your blazer on days when you need something more relaxed but still office-appropriate. Just pair it with an oxford shirt, some trousers or chinos, and a tie for smart yet relaxed appearance. You can also opt for loafers over traditional lace-up shoes to prevent the look from becoming too formal. With high quality elastic cotton blend fabric, making you feel warm and comfortable in the chill days. 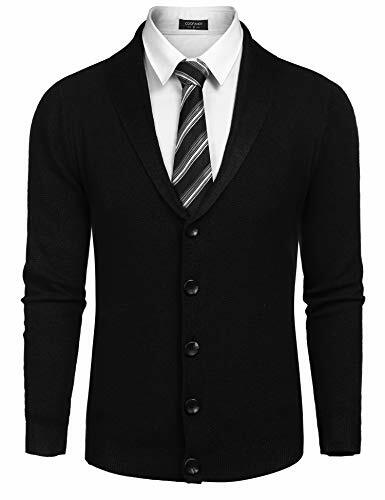 Classic cardigan design in slim fit, featuring with shawl collar, ribbed cuffs and hem,long sleeve, solid color, button front closure and two real side pockets, makes you stylish and classy. You can pair this cotton cardigan with grey chinos for off-duty occasions; Or try to marry this v neck cardigan with dark grey jeans for a laid-back yet fashion-forward outfit. This open-front cardigan will be a perfect gift for hubby,Dad, son, boyfriens or friends. Textured cardigan greats for fall and winter; Suitable for business,casual, date, Christmas party and any off duty occasions. Hand-wash in cold-water, dry clean only, hang dry or tumble dry low.